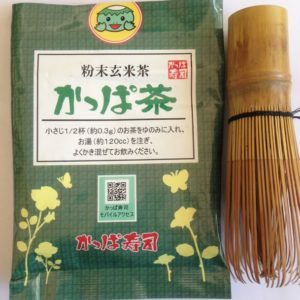 I got this matcha from Japan. 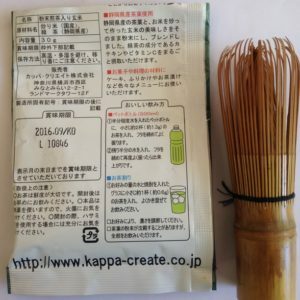 It is called Kappa Matcha Tea. My sister gave it to me last Christmas. It is a different matcha. It has a roasted smell when you open it. I was expecting the same smell just like the others. It was not. I was surprised. I took some photos of the product. Also my drink. This is the second time my sister brought me another kind of matcha. I was excited to check if this is the same match she purchased last Christmas. I made my usual drink. This time I have my whisk with me. I place two teaspoons of powder on my bowl. Pour in a little bit of hot water then whisk it. While whisking it, nutty smell of the steam evaporates. I check the color it’s dark green. Pretty good for a matcha tea. I tasted my tea. All good. It is very rich, nutty and has a roasted smell. I would say not all matchas are created equal. My sister’s husband told me before that every tea house in has have their own flavors. That’s a fact. I thought they were all the same. 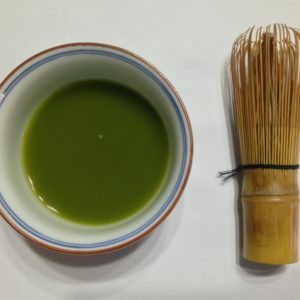 The matcha manufactured from Japan has different standards, flavor, and quality to it. I would say the best ones are created by the monks. The first matcha she brought for me was created by the monks. Overall, I would rate this 8/10 for flavor and texture. For the color and smell, its 9/10. The packaging is cute and in Japanese. So it’s hard for me to understand it. At the back, they provided a large site information which is great for you to buy their matcha tea online. 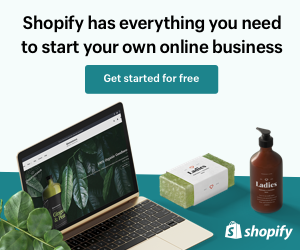 You can check the site online and see what else they offer.